The is the second record-setting auction in a row for this division, beating its previous record of $3.4 million set in November, 2016. 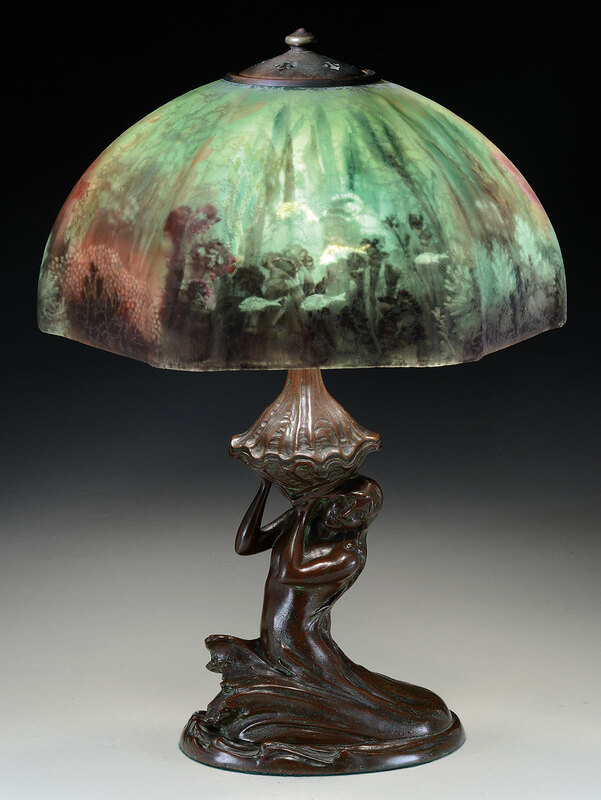 Lot 1108, a Tiffany Studios Dogwood Floor Lamp, Realized $406,600. With successes in every category, Julia's continues to provide great service with outstanding results to consigners and collectors alike. This is an exciting start to the year for our division, and I'm excited to see what the Fall 2017 sale will bring! It was standing room only in the auction hall for James D. Julia's June 16th Rare Lamps, Glass & Fine Jewelry auction. The sale was an incredible success, with a total of over $4.3 million in gross sales, setting a new division record. 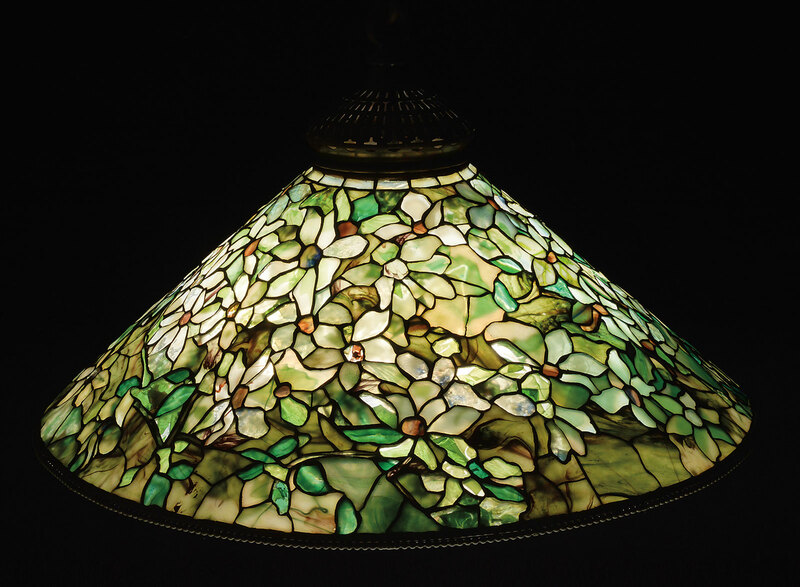 Tiffany Studios led the way, generating strong sell through rates and high prices for some truly outstanding examples form a diverse spectrum of Tiffany work. In leaded glass, highlights included lot 1108, an impressive and rare Tiffany Studios floor lamp with all over dogwood design and an unusual irregular floral lower border. This massive 32” diameter shade rests on a decorated floor base with stylized onion decoration around the platform and bronze wire tendrils climbing the stem. Standing 75″ to the top of pigtail, this impressive floor lamp achieved the highest price of the auction selling for $406,600, well above its pre-auction estimate of $100,000-150,000. Another spectacular Tiffany highlight was lot 1099, a dichroic leaded chandelier with dragonflies surrounding the shade. The colors are just spectacular, each dragonfly having a blue body, red eyes, as well as red and blue striated wings. The dragonflies are set against a rich amber, blue and green background of heavily ripple-textured glass. Estimated at $100,000-150,000, this magnificent chandelier sold for an impressive $228,100. Lot 1365 was a wonderful Tiffany Studios Wisteria leaded glass window with multi-colored purple and blue glass forming the overall wisteria patterns. Each blue wisteria panel is plated on the back side with various panels of confetti and striated glass forming individual petals of the wisteria flower, giving great depth of color. A large panel of striated amber glass is painted on the backside with a scenic design of a tree and pond, which is then plated over with a red panel creating great depth in the window. This window shattered its pre-auction estimate of $100,000-150,000 and sold for $257,850. The Lotus design is one of the most complex geometric patterns that Tiffany Studios offered, and lot 1104 was an excellent example in mottled and striated green and cream panels. The shade rests on a Tiffany Studios bronze base complete with a 6-socket cluster and is finished in a rich, deep brown patina. This study in Tiffany craftsmanship exceeded its pre-auction estimate of $60,000-80,000 and went out at $84,700. Lot 1111, a Tiffany Studios leaded chandelier with all over clematis design, also exceeded its estimate of $40,000-60,000, selling for $76,625. Private estates continue to do well at James D. Julia, and this auction was no exception. Two magnificent private estates were offered completely without reserves in this sale, and the market responded with a lot of pre-auction buzz that led to competitive bidding on every lot. One of these was an estate from a private collector in Texas who had amassed an impressive collection of Tiffany Studios leaded glass, art glass from Daum Nancy, Mt. Washington, Quezal and Stueben, as well as a fabulous collection of estate jewelry. The combined sale price for this estate was over $1.5 million, nearly doubling its low estimate $793,000. The other unreserved private estate that James D. Julia was particularly honored to handle was the estate of Lynda Cunningham, a well-known Tiffany collector from upstate New York. The Lynda Cunningham Estate Collection included a treasure trove of Tiffany Studios metal work and achieved 100% sell through, with overall gross sales of $792,671 which more than doubled the low estimate of $354,200. One of the marvelous highlights from this estate had to be lot 1183, a Tiffany Glass & Decorating Company peacock mirror. Made with a cast bronze frame, the mirror has a peacock feather design enhancing the base and back, with blue iridescent Favrile glass inlays making the eyes of each peacock feather in the base and appearing throughout the stylized floral border. This mirror, in like-new condition, was estimated at $2,500-$3,500 and sold for $13,310. 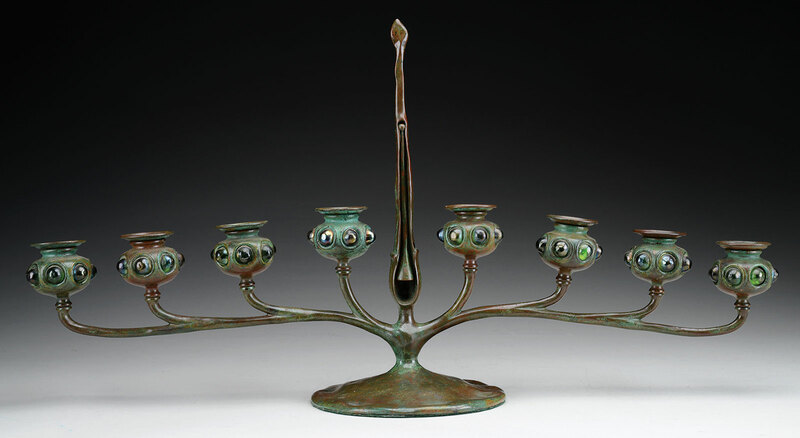 Another excellent example from the Cunningham Estate was lot 1252, a Tiffany Studios jeweled bronze candelabra with eight arms, each supporting a bulbous candle cup set with a band of iridescent glass cabochon jewels. The candelabra is finished in a rich brown patina and is complete with candle snuffer which stores within the center handle. Estimated at a modest $4,000-6,000, it doubled that and sold for $12,100. The June 16th auction also included scarce cameo art glass from various well known makers, none scarcer than lot 1596, a Daum Nancy Cameo Snail Vase. Standing 13” tall, this vase has an acid cut grapevine pattern in bright vitrified colors against an internally decorated yellow, pink, orange and amethyst mottled background, and grape clusters with several applied discs to give them a three-dimensional appearance. What really makes this piece special are the two applied and wheel-carved snails, which are very hard to find intact and undamaged as they are on this vase. Estimated at $17,500-22,500, the final sale price was $21,780. Fine jewelry also performed quite well in this auction, with the combined total of jewelry lots sold exceeding the low estimate by 40%. 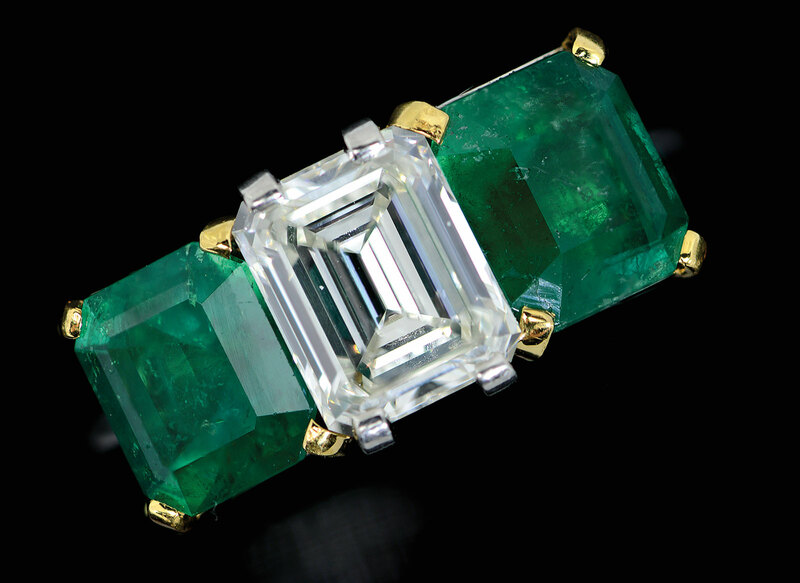 The top grossing jewelry lot was lot 1020, a Cartier emerald and diamond ring centered by a 1.98ct emerald cut diamond that is flanked on either side with a natural Columbian emerald with deep, rich green color. This ring carried an estimate of $20,000-30,000 and sold for $20,570. Another jewelry highlight was lot 1033, a spectacular 18KT sapphire and diamond ring that is centered by a 7.08ct cushion cut natural blue sapphire flanked on either side trapezoid shaped diamonds with a total approximate weight of 1.30cttw. Estimated at $5,000-7,000, the ring topped out at $12,100. James D. Julia’s next auction will be the company’s Fine Art, Asian & Antiques sale on August 16th -18th, 2017. The next Rare Lamps, Glass & Fine Jewelry auction will be in late November, 2017. Lot 120, A Cartier Emerald & Diamond Ring, Realized $20,570. 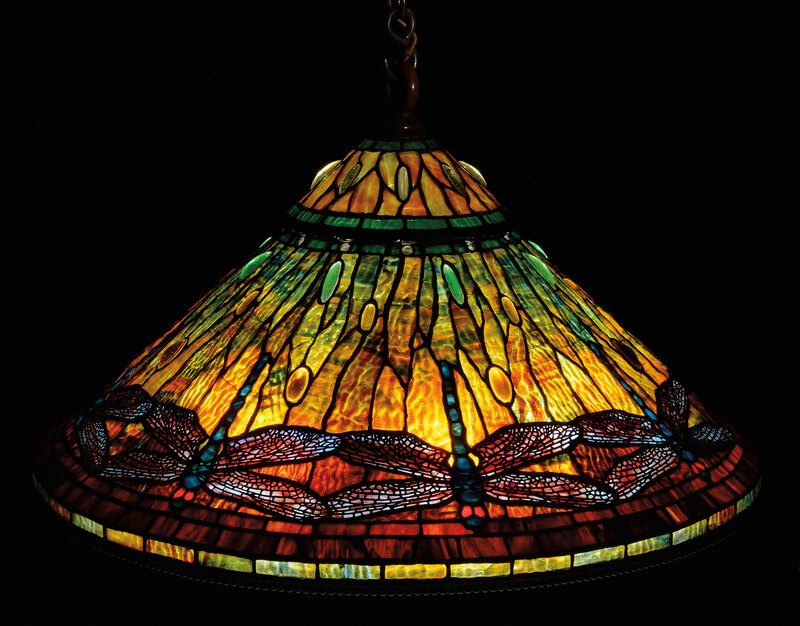 Lot 1099, A Tiffany Studios Dragonfly Chandelier, Realized $228,100. 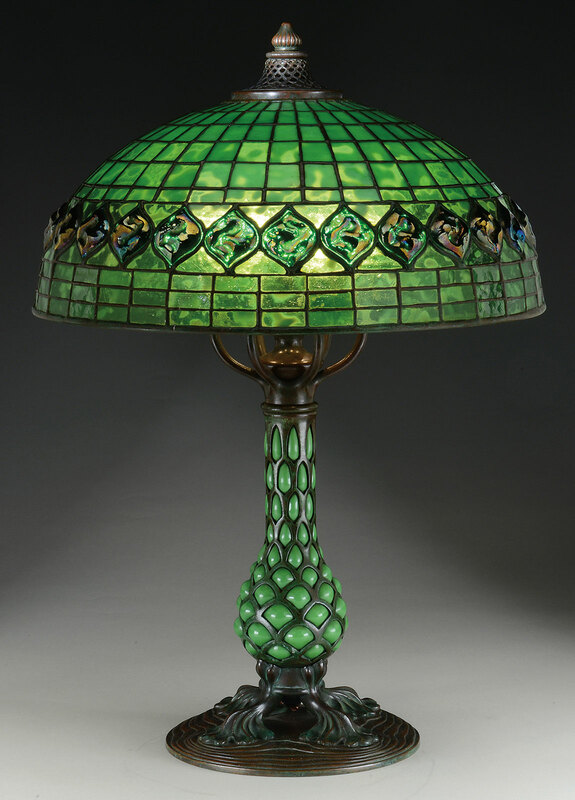 Lot 1104, A Tiffany Studios Lotus Table Lamp, Realized $84,700. 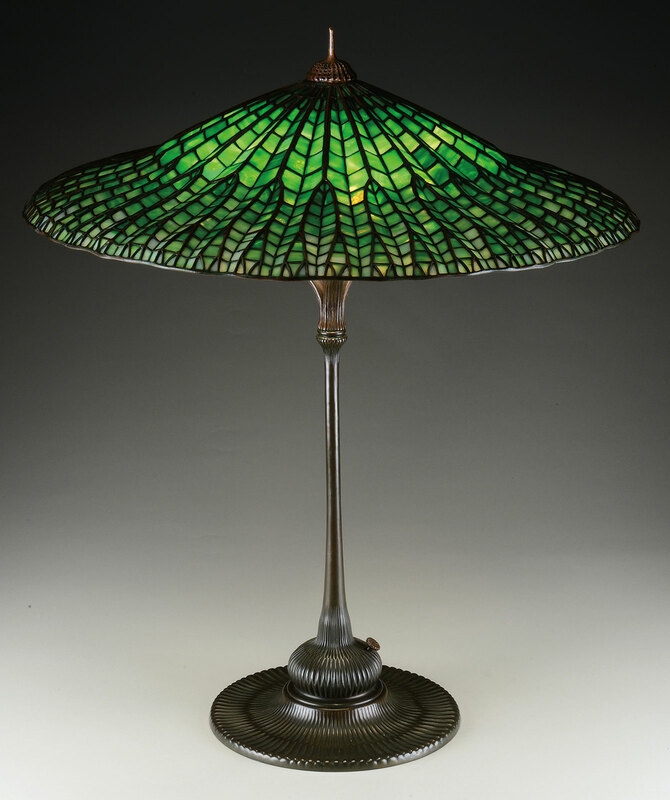 Lot 1107, A Tiffany Studios Turtleback Table Lamp, Realized $72,600. Lot 1111, A Tiffany Studios Clematis Chandelier, Realized $75,625. 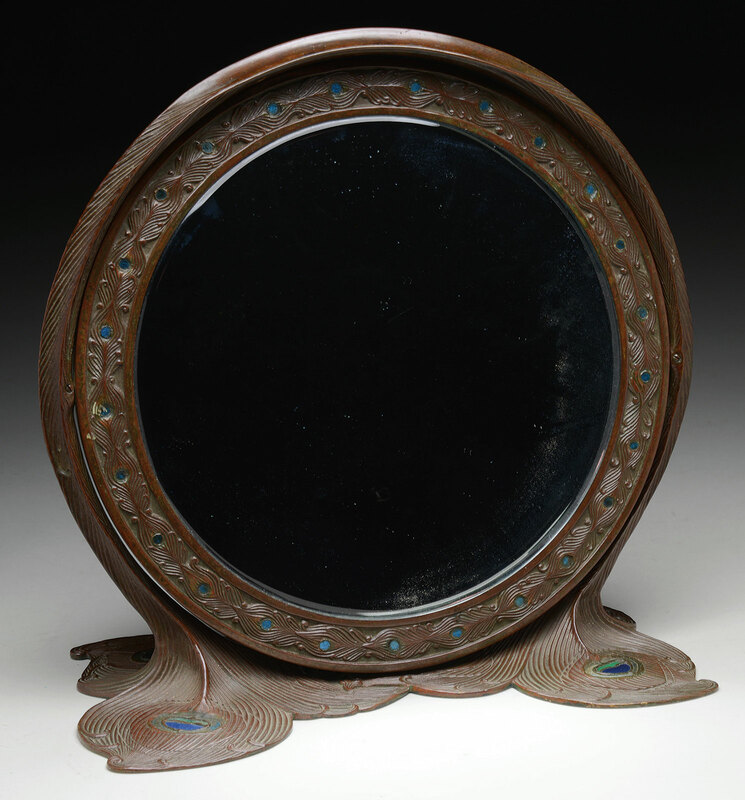 Lot 1183, A Tiffany Glass & Decorating Co. Peacock Mirror, Realized $13,310. Lot 1252, A Tiffany Studios Jeweled Candelabra, Realized $12,100. 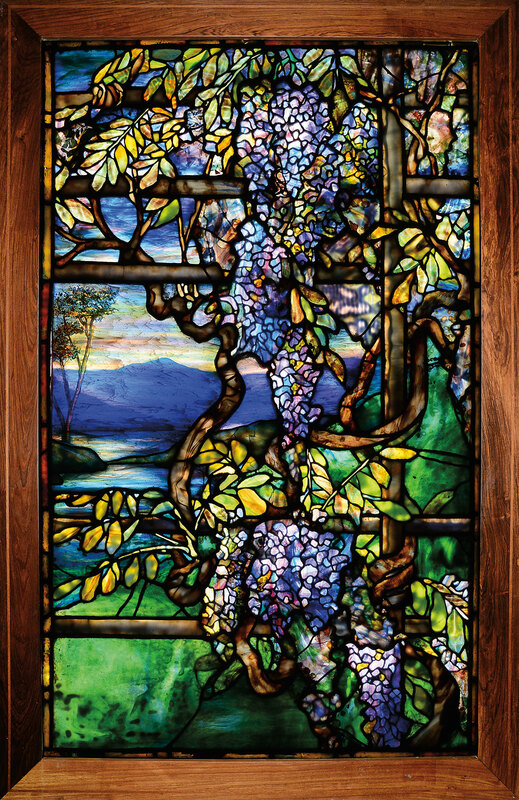 Lot 1365, A Tiffany Studios Leaded Glass Wisteria Window, Realized $257,850. 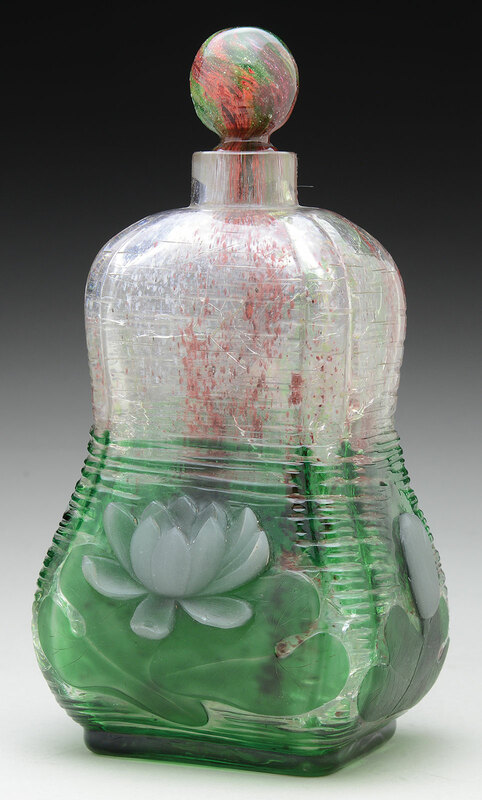 Lot 1589, A E. Michel Cameo Glass Bottle, Realized $20,570. Lot 1596, A Daum Nancy Cameo Snail Vase, Realized $21,780. Lot 1685, A Handel Reverse Painted Underwater Lamp, Realized $36,300. 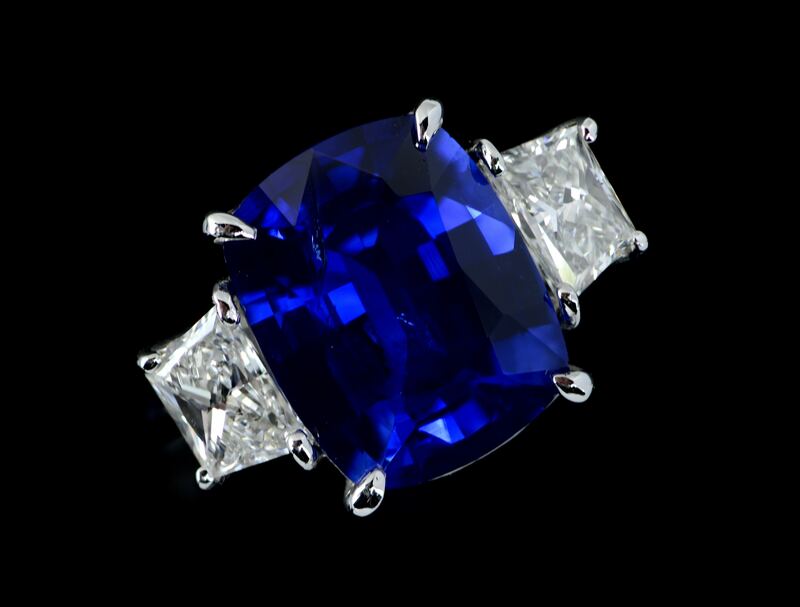 Lot 1033, An 18KT Sapphire and Diamond Ring, Realized $12,100.